HAHAHA! That's hilarious. Well, yeah! I tho't so, too. My family got a huge kick out of it. My mom even had me share it with some close family friends...I was shocked that she did! That is soo funny. I love our job. I just found you and am your newest follower. :o) I will have to pop in more often. Doesn't our job always keep us on our toes and ready for a great laugh! Too funny!! I will have to look for that linky party! 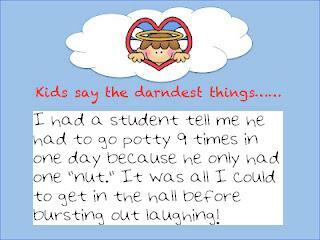 That is the best excuse I've ever heard for having to go to the bathroom a lot!